Add some color spice to your kitchen! Choose this Rubbermaid 4-Piece Mixing Bowl Set of attractive colored nesting bowls and matching measuring spoons to add a smile to your face as you enjoy mixing food in your kitchen. Polypropylene material Is sturdy, durable, and difficult to scratch. Extended bowl lip edges Permit easy gripping, and easy pouring of ingredients. Skid-proof bottom bowl surface Is non-slip TPR gasket to prevent mixing bowls from sliding around on the countertop when being used. Stackable bowls Allow compact storage on counter or in cupboard. 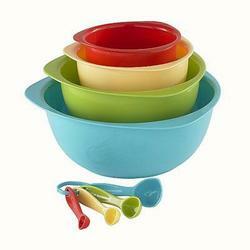 Assorted sizes Allow matching the size of a bowl to the size of the recipe being prepared. Assorted colors Are attractive, look nice in any kitchen setting, and are fun to use.